That’s a VLC screen capture from the RTSP stream; obviously, I must up my clutter control game. I formatted a 32 GB MicroSD card with a 512 MB partition, which may not be strictly necessary, copied the MicroSD CFW bootloader (as demo.bin, sheesh), and it installed without drama. I resized the partition to 32 GB, installed the firmware (per the FAQ) into the root directory, tweaked the configuration files to match my situation, popped it in the camera, plugged the power cable, and It Just Worked™. It would be possible to have the pihole’s DHCP server assign a fixed IP address to each camera, based on its MAC address, but this way the camera knows who it is right from the start and what it’s supposed to be doing. The router isn’t bright enough to route different port numbers on its Internet side to different LAN IP addresses with the same port address, so each camera must stream from a different port number. I don’t plan many world-available video streams, but a friend does enjoy watching the birds during feeder season. The cameras now produce no objectionable network activity, dramatically down from the Wyze firmware’s desperate attempts to contact various servers, every five minutes, around the clock. I have no way of tracking connections made with direct dotted-quad IP addresses, rather than through the pihole, but … this is a distinct improvement. This entry was posted on 2019-04-09, 07:24 and is filed under Electronics Workbench, Photography & Images, Software. You can follow any responses to this entry through RSS 2.0. You can leave a response, or trackback from your own site. 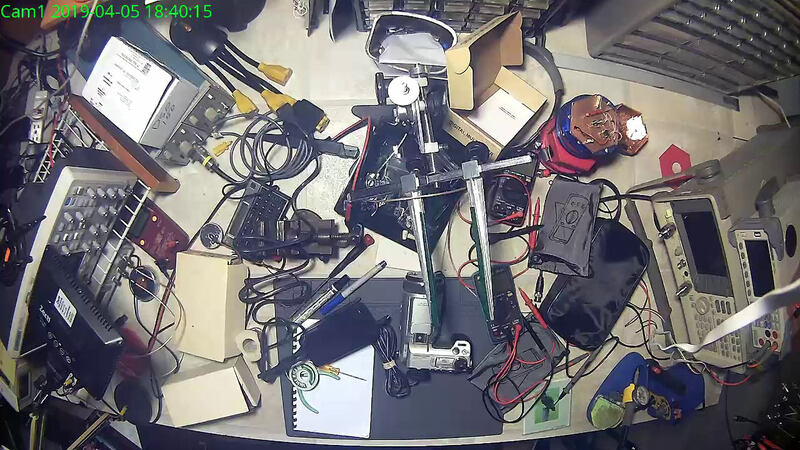 Keep the camera focused on your workbench; that way, nothing will get out of order. Regarding hairpin connections from the last post about these, you could use a VPN on whatever computer you are using to get outside and then come back in from there. Weirdly, the NetGear router handles RTSP hairpins, although I don’t know if it actually bounces data off the far end or just rewrites the URL with the internal IP address. Yeah, live-streaming my fumbling attempts to fix stuff would be just … fascinating. Thinking about what I’m doing and managing a chat session on the side would probably make me fall off the chair. There are people on Youtube who, as the kids today like to say, “make bank” showing their fumbling attempts to fix stuff. I sometimes find myself yelling at the monitor as I watch some of them miss the most obvious solutions to problems.